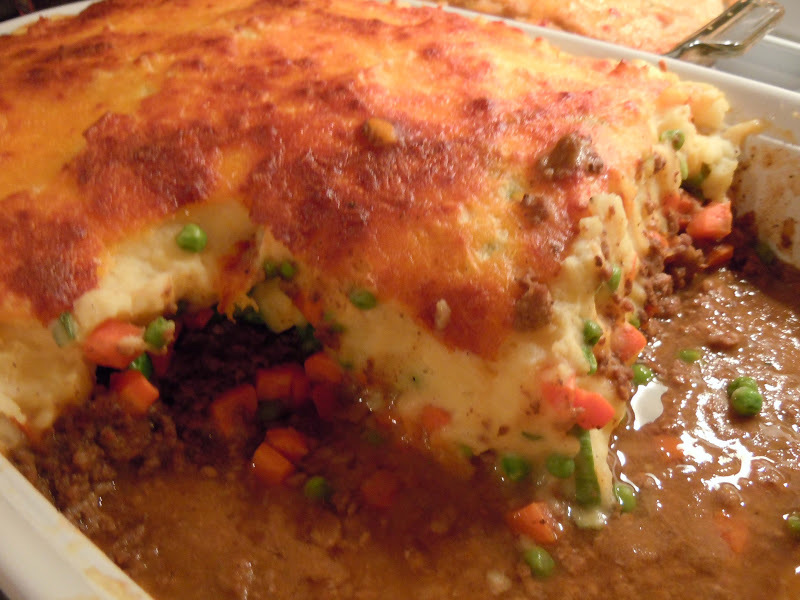 Below is a recipe for Sheri's Shepherd's Pie. This is a basic recipe that I modified after reading many other recipes so it would suit our own personal tastes and preferences. I prefer to use Yukon gold potatoes or any type of yellow potato because I think it adds a richer flavor and I love the color it adds. I also like to add peas -- both for color and taste. I steam my peas lightly so they retain their bright green color and fresh texture. Also, I like to add milk and sour cream to the mashed potatoes because otherwise I feel like they are too dry and dense (the original recipe did not add it). You don't want your mashed potatoes loose, but I prefer them a bit softer which is why I added both the milk and sour cream to mine. 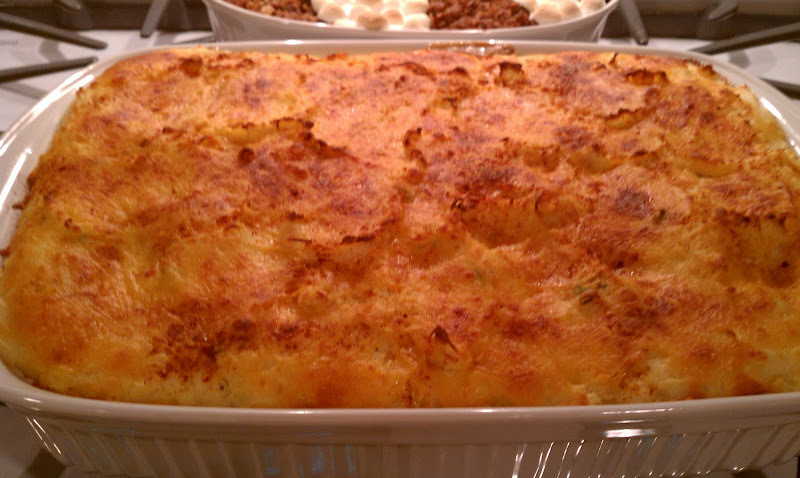 The original recipe had finely chopped raw onion mixed into the potato topping. I don't particularly care for the harsher taste of raw regular onions in this recipe so I substituted milder green onion tops. They give a more delicate onion flavor, and again add a little pop of color to the potatoes too. Worcestershire sauce can be increased, decreased or omitted all together, depending on your taste. I actually think that a splash of red wine added to the ground beef mixture would be good too and I plan to try that next time. Personally, I prefer to use ground sirloin for my ground beef, as I think it is both lean and also adds a great flavor, but you can use your personal favorite meat. The meat mixture in this recipe doesn't have much liquid, so if you prefer it a little more moist or wet, increase your beef broth a little. One of the best things about YOU being the cook is that you get to alter and adjust things to make them exactly how you like them. 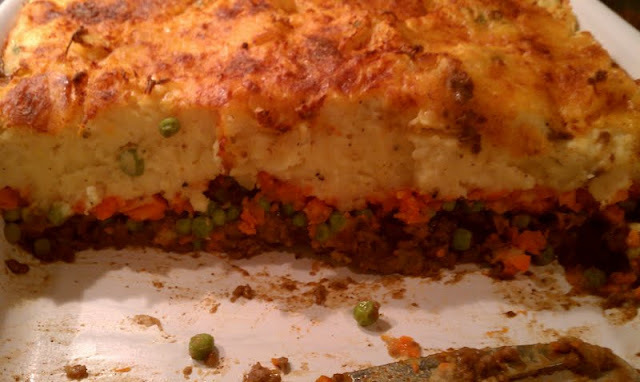 Shepherd's Pie is one of my sons girlfriend's favorite meals, so I made this for her on her birthday. 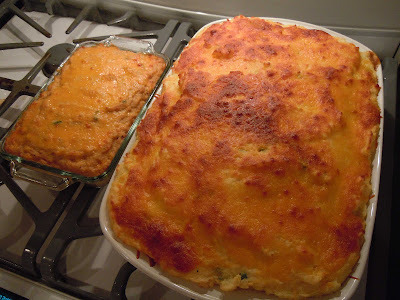 I renamed my modified and improved version of this recipe after her...it will forever be Sheri's Shepherd's Pie! I hope you enjoy this recipe. I admittedly and obviously went a little heavy on the mashed potatoes and added more than the recipe called for, so if yours doesn't look quite the same as mine....that is why! See the recipe and a couple of photos below. Enjoy and happy cooking! Made it again for her birthday this year (November 2012) -- I made the meat a little juicier this year (above 2 pics). The small casserole beside it is the low carb version! Bring a large pot of salted water to a boil. Add potatoes and cook until tender but still firm, about 15 minutes. Drain and mash. Mix in butter, thinly sliced green onion and 1/2 cup shredded cheese. Mix in optional sour cream and/or milk for desired creaminess. Season with salt and pepper to taste; set aside. Heat oil in a large frying pan. Add onion and cook until clear. Add ground beef and cook until well browned. Pour off excess fat, then stir in flour and cook 1 minute. Add ketchup, beef broth and Worcestershire sauce. Bring to a boil, reduce heat and simmer for 5 minutes. Spread the ground beef in an even layer on the bottom of a greased 2-quart casserole dish. Next, spread a layer of mashed carrots; then sprinkle cooked peas evenly over the carrots. Top with the mashed potato mixture and sprinkle with remaining shredded cheese.